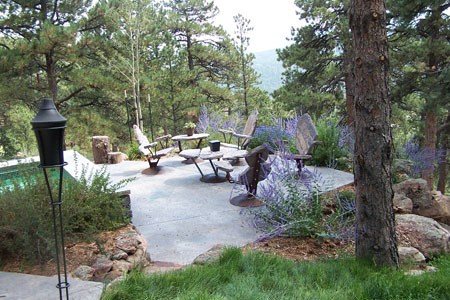 Stone 2 Furniture® creations get notice and appreciated for their creativity, enduring beauty and durability. The following are just a few of our reviews and comments from satisfied customers. “I got your postcard in the mail today and its timing was perfect. I am looking for new pool furniture and a bistro would be perfect under our pergola by the pool. I have purchased from you in the past for my office. The chairs still get as much attention as our mineral collection which surrounds them. Back then I felt the chairs would best express that our geologists really know rock. It takes time to convince visitors to sit and once they do its hard to get them up again because they are so relaxed and comfortable. I met Dwayne and Jill while on business and vacation in Park City, UT in 2009. 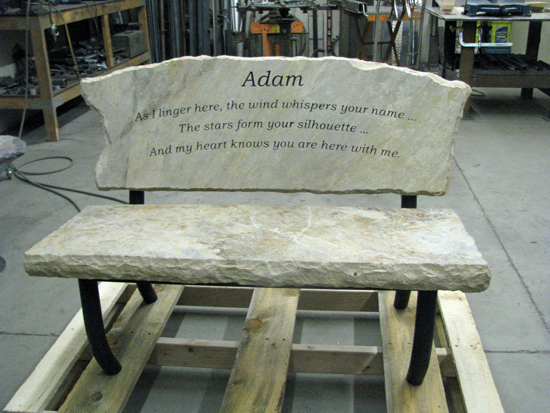 I fell in love with his Stone furniture creations the moment I saw them. 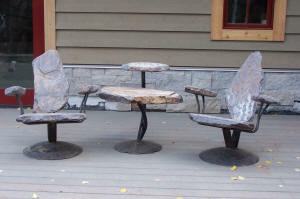 I had recently converted our outdoor furniture to all iron furniture with no cushions. It is about the only way to keep furniture out in the elements. Living in Texas is very rough on outdoor furniture. The heat and relenting sun shortens the life of cushions and paint dramatically. I had kept his brochure and signed up for their newsletter which I read every month. I was trying to decide exactly what my first purchase would be. Since I was not ready for new furniture, we decided on a memorial bench for a side courtyard and garden that my wife keeps in memory of our late son. When I showed her what Dwayne and I came up with, she was elated. Dwayne had it etched exactly like we wanted and made sure it was crated and shipped carefully. We put it in place in 2011 and are continuing to create a space around it. It is truly a beautiful way to remember a loved one. After this purchase, Dwayne and Jill created their Wine Buddy tables. I, again, fell in love with them and knew exactly how many I wanted. We purchased 5 to compliment our furniture areas by our outdoor fireplace and under our porch. They are perfect for everything. I had one damaged in transit and worked with Dwayne to get a replacement stand that was bent. No problems. I have thoroughly enjoyed working with these fine folks. They will do everything in their power to please you and make exactly what your heart desires. I actually cannot wait for my iron furniture to finally wear out. I want a stone furniture sitting area around my fireplace one day. Thank you Dwayne and Jill. Working with you has been a real pleasure. Best of luck in the future.—K. Ferris Daingerfield, TX. “Our furniture arrived today, its even better than we ever dreamed!